The last issue of the series I own, is issue 45 so something clearly happened between the two issues. I believe it was issue 46. I know this is the continuation of that last arc so things wrapped up and the New Mutants made it out safely. in San Francisco, at a Ribstickers BBQ restaurant – which I’m not familiar with – the New Mutants are enjoying a meal after returning from the future where they fought TrueFriend, who was Doug at his most evil. 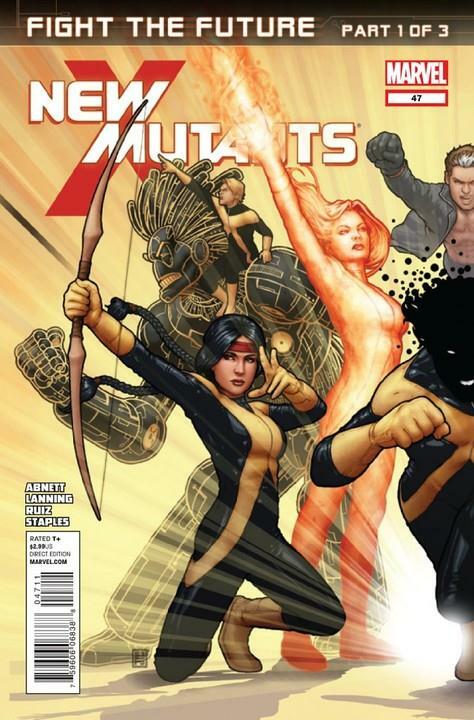 The New Mutants are – Dani, Sunspot, Magma, X-Man, Cypher, Warlock and Blink. Not the worst line up. That is from the credit page, Sunspot and Karma are also on the team. Not sure why they only went with seven faces when there is nine. Apparently, Magma almost got a job at this restaurant. Though, why she would need a job and no one else, is beyond me. Doesn’t sound intriguing enough to warrant a Google search. Also, when the waiter serves you your food, they have to say – Ribstickers hopes it all sticks to your ribs. I would hate that after my third visit there. Especially, as I’m sure, some of the wait staff would hate doing this, 70 times a day and won’t be able to hide it. Cannonball appreciates that they all get to sit and share a meal together, they don’t get this opportunity too often. All it took was a megalomaniac ruler to do it. Dani tells Sam that he just ruined the mood as that ruler was Doug. Sam apologizes and Doug is clearly worried if that is what the future has in store for him. Doug notices that something isn’t quite right but the team chalks it up to the time travel. Nate Gray, X-Man, who I don’t remember being this fun during his solo ongoing from the 90s, makes a great reference to his own situation. Time travel is weird, you can go back in time and only be ten years younger than your father and have a niece from a possible future timeline that may or may not never exist. Blink makes a toast and they all cheer. Jean Grey School. Doug is being looked over by Beast. Beast believes what Doug is feeling is a hangover. He is a light weight. Doug isn’t sure that is what it is but is glad that nothing is overly wrong with him. Beast gives Doug some pills for the hangover. Kitty shows up and is glad that Doug is feeling better. Doug turns in shame. Kitty offers to them that they can stay at the school for as long as they want. Dani says that is a nice offer but they agreed to stick with Cyclops after the split. This confuses Kitty as Cyclops and Wolverine only had a little argument and the school was the compromise. This all makes sense to Doug now, they are in an alternate timeline! The restaurant’s color scheme was wrong, Kitty’s X is on the wrong side (though it is a completely different costume, altogether) – he needs to figure out what else is different. This is what Kitty Pryde looks like in the alternate timeline. Greenwich Village. The New Mutants, minus Doug, are at Doctor Strange’s house. Who knew that when I made that order at Mile High Comics that I would have gotten three comics with Doctor Strange in them? I wonder how many other appearances of the good Doctor do I own now? Doctor Strange is in not good shape. He’s gone a tad bit crazy as he first detected the change in the timeline but no one believed him. Others who also felt the change have gone insane or killed themselves. When Blink teleports the team, it looks just like Magik’s stepping discs and it is this that makes me realize that this team always needs a teleporter. Apparently, Doctor Strange and the Defenders helped the New Mutants out on a previous adventure but this isn’t the same timeline. Jean Grey School. Kitty is checking on Doug, who hasn’t taken a break in a long time. This new timeline doesn’t make any sense. It has contradictions and paradoxes, the timeline was created and forced together. Karma brings Face, one of the Inferno babies who is now all grown up from the last storyline Magik was in, maybe twenty issues ago, I guess he’s been traveling with the team this entire time. Face sees Doug, and freaks out and blasts at him. Doug gets tackled to the ground, just missing the blast. Once the dust clears, Kitty announces that Karma (still with both legs!) is dead! Though I’m not sure how that could have happened and Face pushed her behind him before the blast but oh noes! 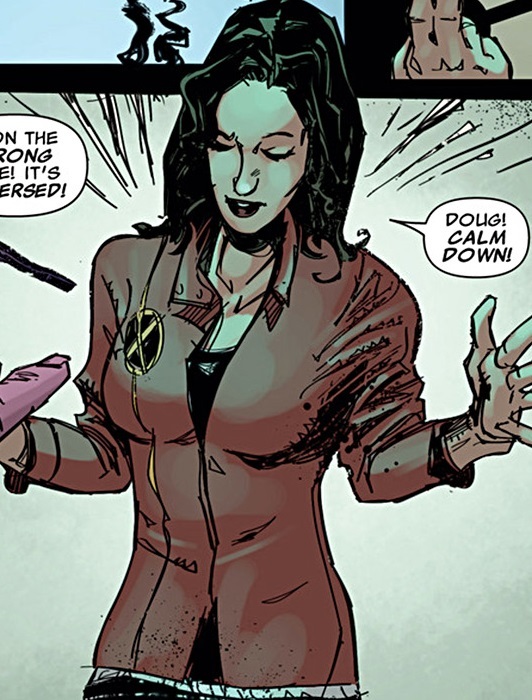 Don’t worry, Karma gets better as she is a later member of the final Astonishing X-Men cast. That’s all I know. The next issue I own is issue 50, the series finale so we will have to try to figure out how this story concludes with who is left standing at the beginning of that issue. I have plans to review issue 50 relatively soon.